Los Alamitos Shutters Rossmoor community - Orange County Shutters. Los Alamitos Shutters – Here at Orange County Shutters we are known for our top quality wood plantation shutters. And have been installing them for years in many satisfied customers homes. Just like we recently installed for John & Maggie S. in Los Alamitos shutters in CA, in the community of Rossmoor. Even though we are known for our beautiful wood plantation shutters we also offer a wide variety of other products to meet our customer’s window covering needs. Like the custom draperies and woven wood shades that we installed at this customers home. For the Los Alamitos Shutters we chose a classic and stylish outside mount deco frame which added beauty and definition to their windows. To create a little zing we added the hidden tilt feature to make their shutters have a more unique look and added feature of the ability to open and close the top and bottom independent from each other. They were a little worried about one of their rooms since it had a corner window.But at Orange County Shutters be it a corner window, specialty shape, or a challenging window we have you covered literally. 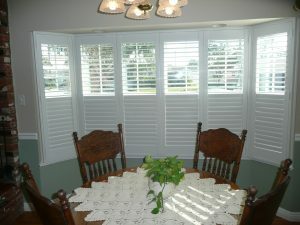 Now not every window may call for out luxurious shutters like we provide. Our client wasn’t worried since we had the perfect alternative solutions for them. We chose to make custom draperies and custom wood poles with rings to not only accent the rich look of their kitchen cabinets, but add softness to a large sliding glass door. Even though we could have done shutters on the slider the drapery was a better way to go adding the balance of tradition and elegance. We topped it off in the kitchen with some custom made woven wood shades that accented the drape fabric exquisitely completing the finished look for these wonderful customers. It was a pleasure working with the John & Maggie in Los Alamitos shutters in CA in the Rossmoor community. I know they are going to enjoy the beautiful window coverings that we provided here at Orange County Shutters and look forward to transforming our next customer’s house into a home. Who knows you may be next.